Perfect destination for an unforgettable holiday....Burlington Apartments are located close to beach, shops & restaurants. The walk up apartments are modern and fully self-contained with dishwasher, washing machine, dryer and more. Free cable TV, underground secure carpark, heated pool, bbq-areas & rooftop sundeck. One block away from the beach. Close to shops & restaurants. Australia Zoo, Underwater World, river cruises, tours to Eumundi Markets, Hinterland and much more. Hi, Wendy and I are the resident Manager of the Burlington Holiday Apartments and offer a friendly, Clean environment for your stay with us. We offer Location at an affordable price so we may not always have your dates but hope we can work in with you at some time. All the units in our walk up building have balconies overlooking the tropical pool area and have a north easterly aspect, ensuring sea breezes during the day. Ground floor units have patios. The pool is heated to an inviting 29C for guests swimming enjoyment during the colder months. There is a BBQ area adjacent to the pool for guests to enjoy and experience this wonderful boutique apartment building. The walk up apartments are modern and fully equipped with microwave, dishwasher, appliances, washing machine, clothes dryer and free cable TV. A standard set of linen is provided inclusive of tariffs, any extra linen may be hired at extra cost. We recommend that you bring beach towels for outdoor activities but they are available for hire to reduce luggage. 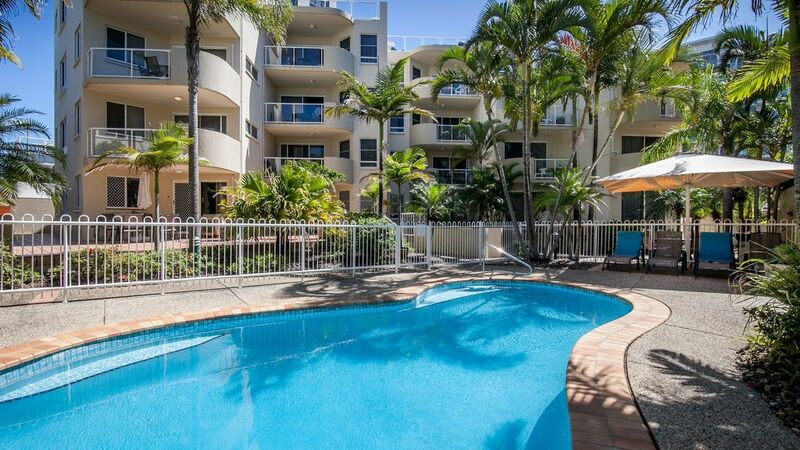 The Burlington Apartments are well situated within the tourist hub of Maroochydore. International cuisines and popular fast foods are available from nearby restaurants. The Sunshine Plaza and Big Top Shopping centres are not far away. For guests with a car the complex has underground security parking. We are situated just one street back from the beach and children's playground park, 400m from the Maroochy Surf Club, Bowls Club and Cotton Tree shops. Like and Follow us on Facebook @ " The Burlington by the sea" to see what events are on for when you will be here. Thanks Debbie and we look forward to seeing you again. A real pleasure dealing with Wendy and Kevin, the property was exactly what was needed for our stay. Great Guests and hope to see you again. Nelda and Don were extremely pleasant and friendly hosts. We had all necessary kitchen and laundry equipment, a heated pool with salt water, and a BBQ area. Very good location. excellent property and great managers, very friendly and obliging. Excellent location, good layout, clean, easy to share with 2 1 couple, very helpful and friendly on site managers. We certainly enjoyed our hassle free stay.